The meta description is one of the most misused elements of a blog post. Over 50% of bloggers that incorporate it are using too few or too many characters, and 28% of bloggers do not even take the time to write one. I am going to reveal how to properly use meta descriptions as the tipping point that will vault your posts to the number one ranking on Google. I am not talking about page 1. I am talking about number one. Before I show you the how, let me explain the why. One of the top five factors of the Google search ranking algorithm is the click through rate. This means if you get searchers to click your post more than the competition, then you will quickly move up to the first page of Google results. There are two ways to improve your click through rate in Google organic search. The first is by creating a great title, and the second is through a cleverly crafted meta description. Most seasoned bloggers consistently create clickable titles. However, very few have mastered the art of the meta description. An exceptional title will help you crack the first page of Google results, but the meta description will take you from ranking number three to number one. Just in case you are wondering what is the traffic difference is between a number one and number three position is, here is a chart that illustrates the vast contrast. 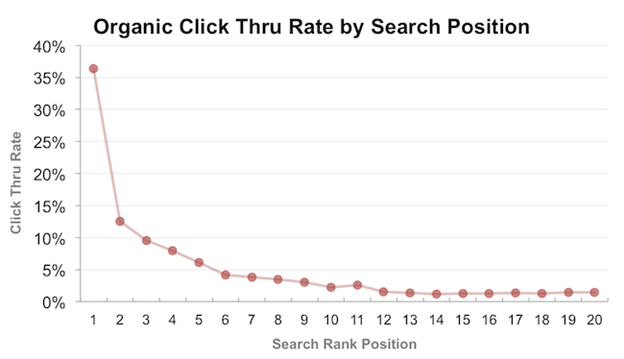 When you look at the organic Google click through rate as a whole, the number one position gets the majority of clicks. If you added all the Google traffic together from the number two through ten rankings, then it would still be less than what the number one ranking gets. 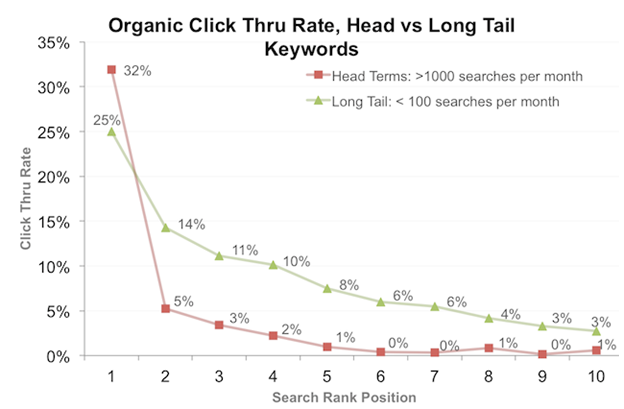 Another study looked at the Google organic click through rate for both head terms and long tail keyword phrases separately. The head terms in this study were defined as any phrase with more than 1000 monthly searches, and the long tail was designated as any phrase with less than 100 searches per month. The number one ranked head terms received 1000% more traffic than the number three position. Although there’s a pretty big difference between how Googlers click on head and long tail results, the long tail number one position still received over 225% more traffic than the number three position. There are eight keys to meta description mastery. Although Google’s algorithm ignores keyword usage in meta descriptions, a strategically placed keyword phrase can draw the eye to the description and increase the click through rate. Every keyword phrase typed into Google search is highlighted in bold throughout each description. I have tested bold versus no bold on several different advertising services, like Flippa and 99 Designs. The bold ads easily received 200% more clicks. While I am not saying that a bolded keyword phrase is going to double your clicks on Google, it will make your result stand out against the other results that fail to use this tactic. Here is a search result listing for the search phrase “meta description.” You can see that both times “meta description” was used in the description it was automatically bolded. In addition to pulling people into reading the description, it makes your post look more relevant. You want your title and description to be relevant and flow together seamlessly. Here is the number one search result for the keyword phrase “SEO Tips,” which does an exceptional job of staying relevant from the title through the description. Here is the search result that is ranking #1001 for the same term. You can easily see how the #1001 ranked search result fails to convey relevancy from the title to the description. That is why this result is buried in the search results. A nicely placed sales copy phrase in your description can persuade searchers into clicking through to your post. If you ever want to see more examples of persuasive copy, then just look at the ads that show up in the Google results. Moz did a study of over 92,000 meta description snippets that showed up in Google results. 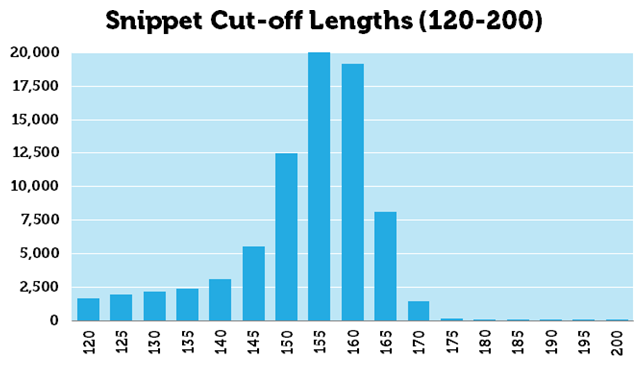 They found that the majority of meta descriptions get cut off right around 156 characters. Try and keep track of your characters when you are crafting your meta descriptions. If you go over your 156 characters in the meta description, then it will get truncated by by Google with the (…). Here is an example of a truncated description in a Google result. Another study by RivalHQ revealed how many posts are using the proper range of characters for the meta description. These findings show the incredible opportunity for bloggers that implement the correct meta description strategy. The ideal range was defined as having between 71 and 155 characters. Only 34% of the results used a meta description that was within the ideal range. A whopping 28% did not even have a meta description. I recommend using between 140 and 150 characters for your meta descriptions. This will allow you to have full control in how people see your posts in Google results. As I just mentioned, Google truncates all meta descriptions beyond 156 characters. 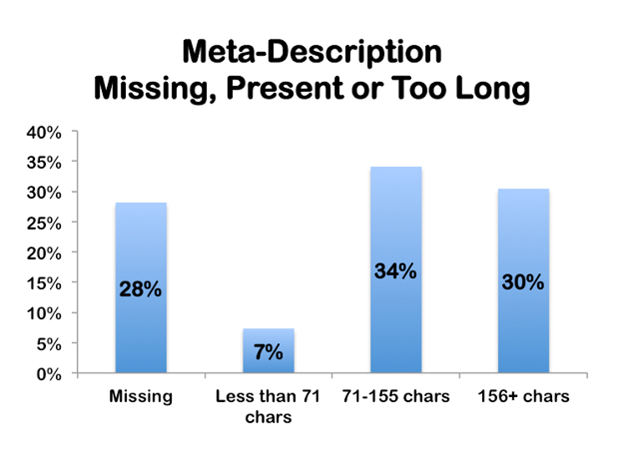 We also identified that more than 30% of meta descriptions in Google results have 156+ characters. So, Googlers are use to see the (…) at the end of descriptions. You can take advantage of this by creating a meta description that intentionally truncates the description. The tactic can be implemented by teasing one of the key points in the final words of the meta description. This truncated tease has been around for almost a century. It started on the front page of newspapers in the early 1900s. They would take featured article titles and place a shortened excerpt right beneath each one. People would begin reading the excerpt before being abruptly cut off. The newspapers were taking advantage of our strong psychological instinct to complete sentences. Most blog themes incorporate this same format into the home page and category sections of blog posts. The standard WordPress excerpt is set to show 55 to 100 characters before showing the “Read More…” link. Now that you have a better understanding of the psychological impulse that drives this beautiful tactic, let’s take a look at an example of how I used the truncated tease in a meta description. There are eleven On Page SEO tactics that pro bloggers use to get ridiculous results. The second sentence delivers the truncated tease. This makes it very, very hard not to click and find out what SEO tactic plays the biggest role. If the Google spider consistently finds duplicate meta descriptions on a domain, then it will ignore all meta descriptions for that domain. The most common scenario where this occurs is when webmasters created multiple variations of the same page. For example, a blogger may have a free consult page with twenty variations that are used for different verticals in Facebook Ads. Since they are not worried about optimizing these pages for Google, they end up using the same meta description on all twenty pages. Whenever you make multiple variations of any page, always remember to use a plugin that will allow you to “No Index” these pages. Google ignores any page or post that has been labeled as “No Index,” and this will keep you from running into a meta description penalty. If you use quotations in your meta description, then Google is going to cut off your description on the first instance of a quotation. The best practice is to only use alphanumeric characters. I use WordPress SEO by Yoast. It is the Ferrari of WordPress SEO plugins. All you have to do is scroll down to the bottom of your post editor to find the Yoast box. It will allow you to type in your meta description and edit it. It will also let you see how it looks in a Google result. In addition, it counts your characters and alerts you when you go over 156 characters. Congratulations, you are officially a meta description jedi master. Now you will be able to knock out persuasive meta descriptions with a tease for every post you make.